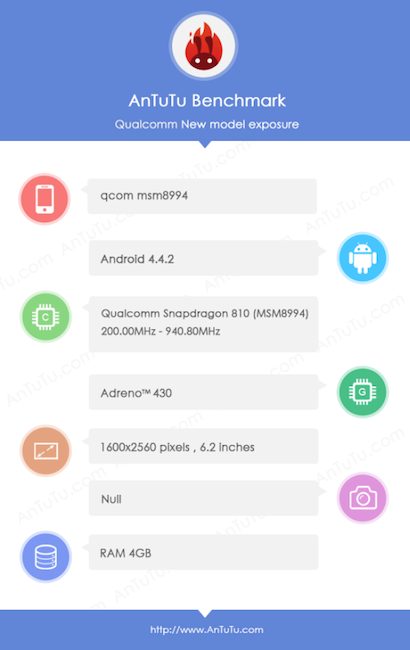 Thanks to the latest newsworthy benchmark posted up on AnTuTu, it looks as if Qualcomm is busy testing the upcoming Snapdragon 810 (MSM8994) processor, using it on a developer device that features a 6.2″ WQXGA resolution, which is the same resolution found on the old Nexus 10 tablet. The chip, according to the benchmark, was only clocked at 200MHz to 940MHz, but don’t let that scare you. During early testing, processors are usually clocked a bit slower, nowhere near their full potential. The Snapdragon 810 is reported to arrive in consumer devices during the first half of 2015, but is not confirmed for any upcoming phones quite yet. If we were to speculate, which we love doing, the Galaxy S6 wouldn’t be completely out of the picture, as well as LG’s G4 flagship next year. If more Snapdragon 810 news pops up, we will keep you posted.